This article details how to install and configure Zendesk Chat-Support integration from Zendesk Support. For information about setting up Chat-Support integration from Zendesk Chat, see Setting up Zendesk Support from Zendesk Chat. In order to set up Zendesk Chat from within Zendesk Support, you must be a Support administrator. Click Admin( ) , then select Channels > Chat or select Chat from the product tray. Your Zendesk Chat account is created and opens automatically. In the welcome window that appears, follow the introductory slides until you are prompted to fill in your Display name and other details, then click Next. The next slide will show you your widget code which you can use to embed Chat support on your website - You can either copy and paste it into your site code now, or leave it for later and click 'Go to Visitor List' to open the dashboard. Note: If you have a Phase 4 Chat-only account, you will need to create a Support account from within the Chat dashboard itself, in order to link the two. You cannot link a Phase 4 Chat-only account to an existing Support account. If you are unsure of what kind of Chat account you have check out our article here. Note: This section applies only if you set up Chat by creating an account from within Zendesk Support. It does not apply if you set up the integration by linking an existing Chat account. When you create a Chat account from within Support, you can manage chat permissions from agents' profiles. The number of agents you can give chat permissions to depends on your Chat subscription. You can purchase Chat licenses for all or just some of your Zendesk Support agents. 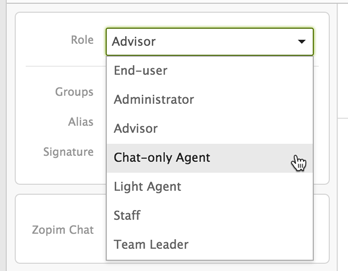 You can also have Chat agents who aren't agents in Zendesk (see To make someone a chat-only agent, below). Note: For integrated Chat accounts, Zendesk Chat roles are equivalent to Zendesk Support roles. This means your Zendesk Support administrators and the account owner will become Zendesk Chat administrators and the account owner. This does not apply to stand-alone Chat accounts. Toggle the Zendesk Chat field to On or Off. Note: :You can only turn chat permissions on for as many agents as your Chat subscription allows. To view details about how many Chat agents you have available, click Admin( ), then select Channels > Chat. To change the agent's alias that appears Chat, edit the Chat Namefield. Chat-only agents have full agent access to Chat but only have limited access to Support. Chat-only agents are not available to customers using Zendesk Suite. Under Role, select Chat-only Agent. Join, leave, or respond to chat conversations by clicking the Chat top toolbar icon. Access the Chat dashboard, which contains Chat settings and account details, by clicking the Products icon and selecting Chat. You can configure different settings for how tickets are created for both chats and offline messages, as well as whether chat transcripts appear in the ticket as a public reply or private comment. From the Chat dashboard, select Settings > Account > Zendesk Support tab. Automatic Ticket Creation: To automatically create a Support ticket when a chat starts, select Automatic. For agents to manually create tickets, select Manual. Transcript Visibility: Select Publicor Private to determine how the transcript is added to the ticket. Private comments are visible only to agents, while public comments are also visible to ticket requesters and any other end-users that are CCed on the ticket. Details about the visitor's location, IP address, and referring URL are also automatically added to tickets, but are always added as private comments. Ticket Assignment: Select First Agent to always assign tickets created from chats to the first agent who served the chat, regardless of whether the chat was transferred to another agent. Select Last Agent to assign tickets to the agent who ended the chat. Note that with this option, tickets are still initially assigned to the first agent and are reassigned to the last agent only after the chat has ended. Under Ticket Creation -- Offline Messages, also configure the Automatic Ticket Creation and Transcript Visibility settings as described above. Note:This setting only affects tickets created from chats handled in the standalone Zendesk Chat dashboard. This does not affect tickets created using Chat in Zendesk Support, as described above. You can set up who tickets created from chats are assigned to in an agent's profile. Agents can do this themselves or administrators can set it up in an agent's profile. If you don't enter this setting, tickets aren't automatically assigned to anyone. From the dashboard, navigate to Settings> Personal. Click the Zendesk Support tab. Enter a Zendesk agent's email in the Zendesk Support Email field. From the dashboard, navigate to Settings> Agents. Click the name of the agent whose profile you want to edit. Add the Zendesk Chat widget directly to your website. See Adding the Chat widget to your website. Enable the Zendesk Chat widget in your Help Center. See Providing targeted support in your Help Center with Zendesk Chat. Use the Zendesk Support Web Widget. See Using Web Widget to embed customer service in your website. Can you direct me to where I can find information about adding my ZD macros to Zopim chat? I'm afraid there's no way to share or transfer your Zendesk macros over to Zopim. It'll be necessary to recreate them manually in Zopim. Hi, is it possible to display the Zopim chat only on one specific page of our Help Center? Specifically, the Submit Request page for one of our languages only? Anyone can visit our Help Center and read articles, but they need to login and be recognized as a paid user in order to email us directly--we want to restrict chat to those paid users only, and only for the US (where the bulk of our contacts occur). Also, how does this integrate with the standard mobile version of the Help Center (or does it)? Just update this string: mydomain.com/hc/en-us/thepage with the right one. >Also, how does this integrate with the standard mobile version of the Help Center (or does it)? This specific use case will not work if you have the "Mobile Layout" option enabled. Only if you display the full desktop version on mobile OR if you built your own responsive HC UI for mobiles. Cool, thank you! So, if we do have the "Mobile layout" option enabled, will *all* customers see a chat option, or *no* customers will see a chat option? No customers will see the chat option. The "Mobile Layout" can't read custom JS code, so my above code (conditions) will be ignored. so that it shows up on the page regardless of signed-in status, and it still doesn't show up. I do have myself logged in as an agent in IE, with chat status Online, and am trying to access the new request page as a customer in Chrome--I can access the page fine, but the chat widget does not appear (and yes I added the widget script from Zopim). I will move this into a ticket. Is there a way to make the Zopim chat button available to my agents and admins as well? I'm going to see if I can get someone who's knowledgable about Zopim in here to help you; in the mean time, feel free to check out our Zopim Help Center as well! Hello Frank, do you mean on the Agent Interface? Are you wanting to use this for inter-agent chat? Maybe you could explain the intended application in a bit more detail. My intention was for my tier 1 agents (light agents) to be able to chat with our tier 2 agents (admins) from the chat bubble at the bottom of our support page, since they're in different cities. I believe our Zopim Chat bubble used to be visible for our admins and light agents but we recently rebuilt the site. If your light-agents are signed in to your Support site under their light-agent profile, they will not have access to the chat functions within Zendesk. They can sign in as end-users and potentially chat with your agents that way. Another option would be to add them as support agents for Zopim, but that would mean increasing your seat-count for chat purposes. Even logged in as a full agent admin I can open a chat with our chat agents... I just go to whatever page has the chat code (in our case we have several sites) and open a chat. Are you sure that your chat code is working at all? Yeah, it works fine for end-users and anonymous visitors, but not light agents or admins. I remember one of my coworkers had contacted Zopim about this at one point in time, and it was only after that were we able to get live chat working for admins/light agents. I'm not sure what he did. Something odd there. I'm an admin and I can use it fine. I'd go to the Zopim site and try their chat - their support is generally awesome! To be able to use Zopim JS API via the Web Widget, you have to declare the zopim function ($zopim(function()) from inside zE(function(). Hi, I have two agents at Zopim. How can I integrate both agents in Zendesk? I accidentally integrated Zendeks with a new Chat accouunt, how can I delete it and then re-integrate with my two existing chat accounts? Apologies if the answer to my question is somewhere in the comments or KBAs but i was wondering if i setup operating hours for my chat, is it possible to have a customized form shown to the End-User if its past operating hours ? I can't seem to activate Zendesk chat. We already have the widget installed on our site and have enabled it in our settings. And in the Chat system, I have marked my chat agent account as Online. But the Chat button is still not showing up in our Help widget in the bottom right of our website. I tried to follow your instructions above to go add Zendesk Chat from the App Marketplace, but it doesn't appear to be there! What am I missing? I'm very sorry to hear that the Chat button is not showing up for you. I am sending you an email to review your settings to see why that may not be working. Please, keep an eye out for that! is it possible to run the chat on different domains with the same account at the same time? Yes. You can place the the widget on multiple different portals and accept chats at the same time. Can you help me.I am having problem in paid subscription and i am not able to contact zendesk. As i already sent mail. What sort of issues are you having with your account? I see you already have a ticket created with our Finance Team so if this is billing related then they will follow up with you as soon as they can. Let us know if there's anything else we can assist with regarding your account.